Global Bio-based Polyethylene Terephthalate Market « Global Market Insights, Inc.
Bio based polyethylene terephthalate (PET) market has been gearing up at a fast pace validated from the commendable industry share record over the recent years. In 2015, the market capacity in terms of volume was almost 496 kilotons and in terms of revenue it surpassed the billion-dollar mark. Statistics depict that the industry is set to attain a phenomenal revenue of USD 13 billion by 2023. Emergence of bioplastics as an alternative to conventional packaging in food and beverage industry has prominently catapulted the bio based PET market expansion. Global sustainable packaging market which worth USD 150 billion in 2015, is slated to hit a revenue of USD 250 billion by 2024, projecting a parallel impact on PET market as well. Alongside, stringent governmental norms which have built an awareness among the consumers about the benefits of using ecofriendly products, has also complemented bio based PET market growth chart. The market is also highly influenced by the growing strategic partnerships between the leading market giants. For instance, Toray and the Coca-Cola company have collaborated with bio-based manufacturing units like Virent and Gevo, with an aim to develop 100% bio-based polyethylene terephthalate. Bio-based PET weighs much less in comparison to its fossil fuel counterparts, as a result of which the bio based PET market demand from automotive industry is surging with each passing year. Leading automotive companies which include Nissan, Toyota, AT&T, have announced to implement bioplastics in their advanced vehicle model, which in turn is expected to positively influence bio based polyethylene terephthalate market penetration on technical grounds. The overall market from technical applications is projected to record a shooting CAGR of 35% over 2016-2023. High shatter resistance and light weight characteristic are the major two factors which are driving bio based PET market demand in manufacturing vehicle’s interior and exterior parts. The U.S. and the European Commission have set norms and standards to improve the fuel efficiency in vehicles which in a way will leave an impact on the market outlook as well. Bottle packaging applications will also account for a major portion of the bio based PET market share in the coming years. The projection can be grounded on the increasing investments in green technology by BRICS nations. Increasing food and beverage consumption in these regions have boosted sustainable packaging adoption in this belt. Australian Packaging Covenant’s initiations in promoting sustainable packaging have impelled the global market growth. Overall, bio based PET market from bottling applications is anticipated to experience a revenue record of USD 10.5 billion by the end of 2023. Regionally, Europe will observe a substantial growth from this application domain. As per estimation, Europe bottle packaging applications will grow strikingly at a CAGR of 37% over 2016-2023, with a revenue collection of USD 2.3 billion by 2023. Asia Pacific dominated the global bio based polyethylene industry in 2015, by accounting for more than 32.5% of the industry demand. The increasing consumption of carbonated soft drinks and alcoholic beverages in China and India have widened the application scope of the market in this region. The trend is likely to continue in the coming time frame also. Latin America with Brazil at the growth front will also record tremendous gains in bio based PET market with a forecast CAGR of over 46.5% over the period 2016-2023. The decline in crude oil price trends though is favoring synthetic product based market, however growing consumer awareness about greenhouse gas emissions undoubtedly will allow a profitable road map to the bio based PET industry. As per a report by Global Market Insights, Inc., bio based polyethylene terephthalate market is set to record a striking double digit CAGR of more than 40% over the period of 2016-2023. Major competitors of bio based PET industry include Toray Industries, Teijin Limited, Coca-Cola, Plastipak Holdings, Toyota Tsusho, and M&G Chemicals. 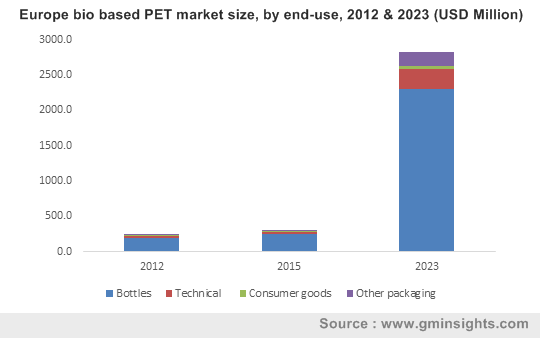 This entry was posted in BIOMASS, BIOENERGY AND RENEWABLE CHEMISTRY and tagged Bio Based Polyethylene Terephthalate Market, Bio Based Polyethylene Terephthalate Market Share, Bio-based PET Market, Bio-based PET Market Size, Global Bio-based Polyethylene Terephthalate Market.